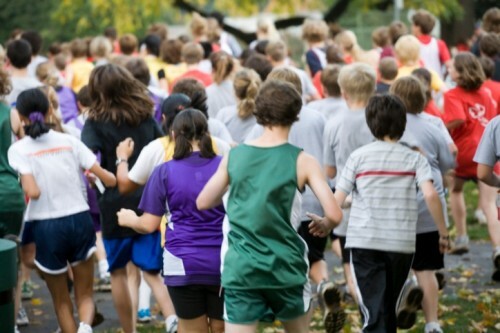 Running is an excellent form of exercise and is growing in popularity. With an increasing frequency of inactivity and childhood obesity, promoting physical activity in kids is extremely important. Kids have a natural desire to move around and play. Running is a natural progression of this and can develop into a lifelong interest. So who is considered a “running” athlete? Cross-country and track first come to mind, but don’t forget sports such as soccer, football, or lacrosse. A typical soccer game played at the varsity level can consist of 7-9 miles, if an athlete plays the entire game. And in the peak of the season, a cross country athlete might run 20-30 miles per week or more. Each sport comes with its own recommendations of training intensity for kids. The number one rule to remember when it comes to fitness in kids is to emphasize fun and safety. When running stops being fun or aches and pains become commonplace, that’s when we need to worry we’re pushing our kids too far. Keep these tips in mind to help prevent injuries. Invest in a good pair of running shoes, socks, and appropriate clothing. Most local running stores have employees trained in gait (walking) and running analysis. They make educated recommendations on proper footwear for each individual. Running shoes should be changed every 300-500 miles or if breakdown is occurring. Moisture wicking (not cotton!) socks and clothing are also important to prevent blisters and help with body heat regulation. Maintain a well-balanced diet, and drink plenty of water every day – not just race/game day. Proper nutrition is important in all kids but especially in athletes. Avoid running in extreme heat or cold. High humidity should also be avoided. If you are running in warm weather, remember to wear bright, reflective clothing made of wicking material, and be sure to hydrate often. If running in cooler weather, dress in thin, wicking layers, and don’t forget gloves and a hat. Hydration is still crucial in colder temperatures, too. Stretch both before and after running. It’s important to stretch the major muscle groups in your legs – quads (thighs), hamstrings (back of your thighs), calves, and hips. Dynamic stretching prior to running is an excellent warm-up, while static stretching can be used as part of a cool down. Foam rolling is also beneficial for these muscle groups. Follow intense running/workout days with an easy or rest day. Youth should have 1-2 rest days per week. Running should not be your only form of exercise. Cross training is very important. Biking, swimming, and elliptical are excellent alternatives. Build your mileage gradually - no more than a 10 percent increase per week. The most common injures that affect runners are typically the result of overuse. Too sharp of an increase in mileage can predispose runners to injuries like shin splints, tendinitis, or even stress fractures. Taking a walking break is not a sign of failure. Walk/jog intervals can help with increasing overall endurance. If possible, avoid running on uneven or slanted surfaces (like the sides of roads). Be alert and aware of your surroundings. Run with a partner or let someone know which route you’ll take. If you listen to music while running, keep one ear free. Avoid running at night. Work with coaches/trainers on proper running technique. Many local running stores also offer free classes on running form. Don’t ignore pain! “No Pain, No Gain” does not apply. Unfortunately, aches and pains from running can happen. Don’t ignore it or think it will go away. If your child is having pain from running or you are concerned about risk of injury, a visit to a physical therapist can be extremely beneficial. At Cook Children’s, our SPORTS physical therapists have experience with the common injuries that affect runners. We also have staff members who are active runners and understand the demands of the sport. 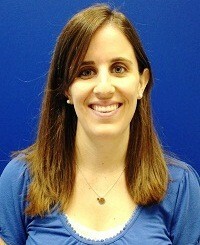 Melissa Bro, PT, DPT, is a physical therapist for the Cook Children's SPORTS Rehab program. Our physicians, therapists, nurses and technologists work exclusively with kids and understand the unique needs of a growing athlete's bones, muscles, body and mind. As a part of Cook Children's integrated pediatric health care system, our patients have access to a multitude of pediatric specialty areas with board certified doctors, as well as laboratory services, nutritional consultations and sports medicine counseling. Patients benefit from this integrated system because it allows our staff to use all of the system's resources during treatment. It also improves communication between the various departments whose physicians are focused on caring for children and adolescents. If you have a young runner, sign them up for the Cook Children's 5K at 9:30 a.m. on Saturday, Feb. 27, 2015, as part of the traditional Cowtown running weekend.